We really had some gorgeous entries into our challenge this month. Thanks so much to everyone that joined in! Our new April Challenge will start tomorrow so check back for the details and some inspiration. 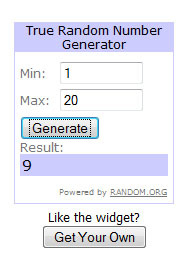 #9 who is Jacqueline from Made by Jacqueline is our winner! Please send an email to Lora at sinkler-lake at rogers dot com. Please note that Lora will respond to your email later next week after she returns from Holiday. Hi all, Madge here with a Christmas Project Tutorial to get you started on gifts for special people. A homemade gift is straight from the heart and shows that you have taken the time to make something special. I have been making these calendars for about 3 years. Last year I made 30 to give as a “Christmas Card” to my stamping buddies. You can adapt this to any size you would like, but for this sample / calendar, I have made it A4 size 4 1/4” x 5 1/2”. Sturdy cardstock: 5 1/2” x 8 1/2” (or 6” x 12” or 5” x 10”). Length is double desired height. 2012 file (Print onto white cardstock, and cut apart). Unfortunately, my calendar pdf could not be uploaded - if you print the above at 6 columns and “gray font”. You will get a good replica. 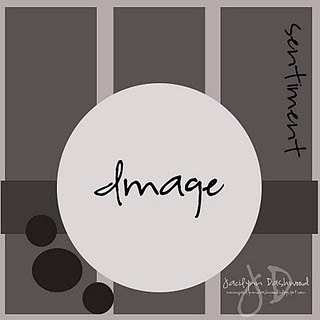 4 designer papers: 4” x 5 1/4” (Good way to use up those Designer Paper pieces & scraps). I used 4 wonderful 6” x 6” pages from Webster’s Pages. purchased at OCS Lora has a wonderful selection of 6” x 6” pads. 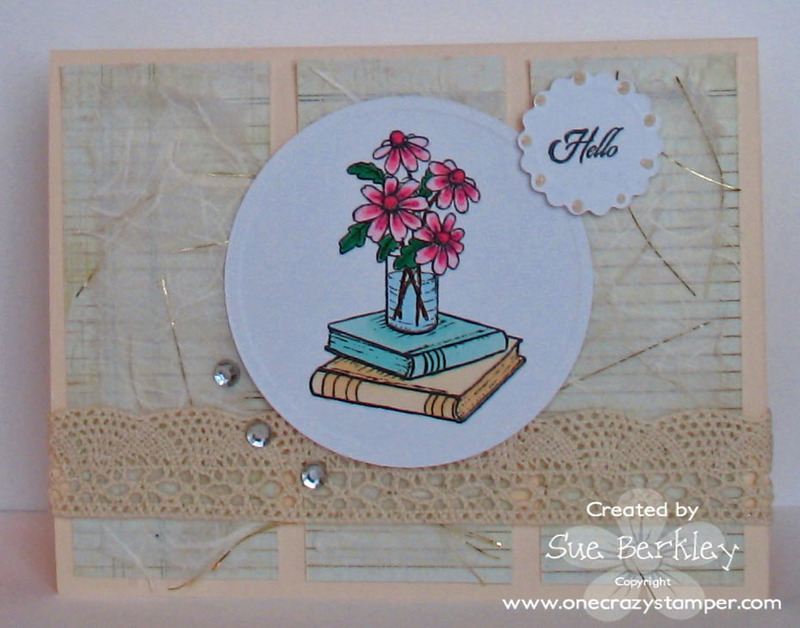 Assorted embellishments: stamps, inks, punchies, Designer Papers. Scraps! Scraps! Scraps! Strong adhesive to guarantee your calendar can withstand a year of being displayed. Step One: Score cardstock in half along longest edge (8 1/2”) This will give you 4 “pages”. Step Two: Cut out each month, and mat in groups of 3. Jan. Feb. March / April May June / July Aug. Sept. / Oct. Nov. Dec. Step Three: (Tip) I make a 1/4” frame to visualize the placement I want for my “page” layout. Step Three: Cut Designer paper 1/4” smaller than your “page” ie: 4” x 5 1/4”. Adhere to “page”. Step Four: Add matted months and any embellishments. (Let your creativity run wild). Step Five: Punch 2 holes about 1/2” apart on the centre bottom of your pages. Step Six: With Jan. Feb. Mar. facing you - thread your ribbon into the two holes, leave 1 1/4” on the pieces in the middle, and tie a bow. Your calendar will be freestanding and ready to give to that special friend on your list. P.S. Don’t forget to sign or initial each page. Enjoy! If you have any questions, email me at madgeh@shaw.ca, I’d be happy to help you. Be sure to check in at the OCS challenge for April and a chance to win $$$. See you there! Ok, so some of you that have been faithfully following our blog may realize by now that I am not a stickler for following guidelines (snicker!!). I am by no means a rebellious person, I just think of them more as "suggestions". I was putting this card together and once again, almost (it was very, very close!) forgot to follow the sketch! But luckily, I caught myself in time and cut my paper (oohhh.. it is so pretty!!!) into the three sections! Can I tell you how thrilled I am that Stampavie is carrying some of Mo Manning's amazing images in rubber??!! This is one of my all time favorites Fairy Kiki!! I told you that paper is gorgeous!! That is from Kaisercraft . Yummy!! Lora has some great deals on Patterned Paper right now in the clearance section!! Some are as low as .49 cents for 12x12 paper!! I distressed the edges with Tim Holtz Distress Inks. I happened to use Broken China and Faded Jeans. She was colored with Prismacolor pencils and OMS after stamping with Memento Tuxedo Black Ink. She was cut out using Spellbinders Circle and Scallop Circles Nestabilities. You can see a few close ups on my blog. Good luck on winning that $25 Gift Certificate but you can't win if you don't play ; ) You also have to use product from the store to be eligible for the prize. Positive thinking, though we are still buried under a foot of snow here in Wisconsin!! 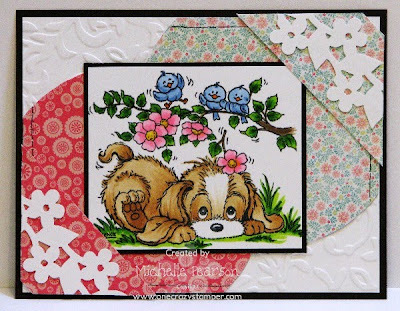 I was just itching to use this adorable stamp from Stampavie's 2011 winter release called Spring Has Sprung. I stamped the image in Tuxedo Black Memento Ink and colored it with Copic Markers. I used the Victoria Cuttlebug Embossing Folder and designer paper is Tickled Pink from My Mind's Eye. 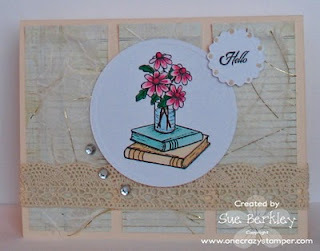 For today's post, I used this stamp set from Flourishes called From the Desk of.. that can be found at One Crazy Stamper. The picture isn't showing the mulberry paper up very well. I torn the edges and mounted it on the patterned paper. I added the Cream pearl around the edge of the eyelet circle that has Hello stamped on it. I know I have been using tons of bright colors lately but I just had to use this paper that was in my stash! I adore The Greeting Farm and of course Anya is SO adorable! This is Sweet Anya and she was a lot of fun to color. I am really big on images that I can color, especially with my copics! Well summer can't get here soon enough for me. Today I have the adorable Bronzing Beauty from Belles 'n Whistles. I stamped her with Memento Tuxedo Black ink and colored her with copics. My favorite cardstock for coloring with copics is Xpress It. I layered her on a die cut. I added a red gingham ribbon for a summery effect and then of course some bright summer bling. All supplies can be purchased from One Crazy Stamper. There is still time to join in our sketch challenge. Check out our blog for the details. Sounds good to me! Here my little buddy Henry partying up with his cupcake! I thought that I would do something a little springy since it’s cold and snowing outside. Hi all, Madge here once again. Today, I’m going to show you what I’ve created using one of the many gorgeous images from Stampavie, Sarah Kay’s wonderful “Bernadette Admiring Spring Flowers, available at One Crazy Stamper. If you follow along with OCS’s challenges, you’ll know that this month our DT Leader Jacilynn supplied us with an awesome sketch. Well, to keep up with the challenge, my card has followed her sketch (well, sorta / kinda). Inside, “may your day bloom with happiness” is stamped. I really loved the way this card came together and even used a piece of patterned paper that has been kicking around forever – hundreds of pieces of cardstock and dp’s and this is the piece that saved the day! Supplies used: Copics, (too many to mention), Spellbinders Scalloped Circle dies, MS border punch, Prima flowers, MS Fern punch, Bazill cardstock, and Organza Ribbon and butterfly charm from stash. Next week, I will be doing a tutorial for a Christmas Gift that you may like to see, along with a pdf to help you along. So, see you next week, same time, same station. Dana here and guess what?? I finally followed Jacilynn's amazing sketch to the "T"!! It's not that I dislike sketches, it's that I often get lost in the creative cloud while cardmaking and totally forget I am SUPPOSED to be following a sketch ; ) Usually by the time I remember, I am too far gone to be able to make it fit. This time I focused.. and I mean FOCUSED!! But this is way too cool of a sketch not to follow and I am so thrilled with the final results!! I used Cherry Emma from CC Designs. She was colored with Copics after being stamped with Tuxedo Black Memento Ink. My background papers are textured Bazzill cardstock. I am not sure why it looks kind of glittery.. must be reflections from the lights in my room. The image was cut out and pop dotted onto a Circle Nestabilitie and Lacey Circle Nestabilitie from Spellbinders. 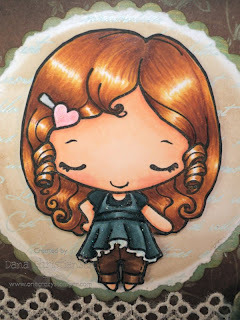 If you would like a list of the Copics I used or to see what she looks like colored in Prismacolor pencils you can pop over to my personal blog. Don't forget, you still have plenty of time to follow this amazing sketch and get into the running to win a $25 Gift card to One Crazy Stamper. I've been waiting to do this image up....but now that the snow drifts have disappeared and I am seeing peeks of green in my flower gardens, I decided it's time! Some of the first flowers to bloom are my mini iris...they are so vibrant and are a welcom sight after a Wisconsin winter! The set is Beauty Within by Flourishes. I stamped my images with Memento ink and colored them with Copic Markers. The sentiment is also from this set. 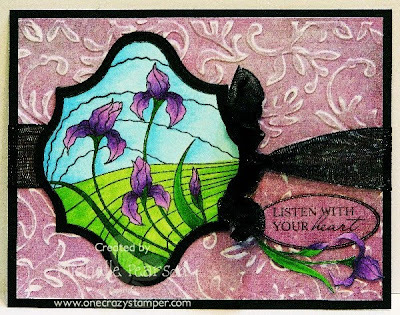 I cut the image out and then layered it on a Spellbinders Labels Thirteen die. My ribbon is heated with a heat gun to crinkle it up. I stamped the oval that surrounds my word from the Fancy Accents Spellbinders Compatible Set and cut it out. The designer paper is BasicGrey's Kioshi collection which I ran through the Cuttlebug Victoria embossing folder. I sanded the embossing to highlight it a bit futher. You still have time to hop in and join us for our monthly challenge...there is a gift certificate on the line for a lucky participant. Maybe it will be You! 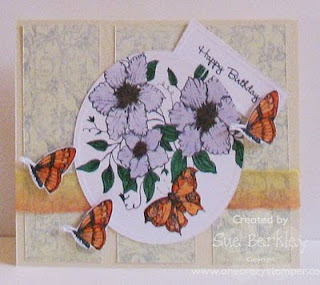 It is Sue here, and for today's post I used Flourishes Butterflies and Clematis stamp from One Crazy Stamper. Don't forget to enter this month's sketch challenge to win a $25.00 Gift Certificate. All supplies can be found at Lora's store One Crazy Stamper. YNS-Erin is visiting from Ireland! I have a confession to make....are you ready? OK here I go....This is my very first full sized Your Next Stamp that I JUST had to have. We used their super cute images for our previous love challenge but this is my first person! Believe me when I tell you it WILL NOT be my last because she is adorable and just as much fun to color as my other favorites like The Greeting Farm and Kraftin Kimmie. Also, I have a huge love for anything Irish because of my ancestry so if it has clovers or even hints at being Irish I am sold! So I am super happy to introduce Erin from Ireland. I loved how this one turned out! The colors make me smile. I know we always show you the adorable stamps that Lora has in the shop but have you ever checked out the super cute and affordable embellishments???? I did and she always has the most adorable and trendy products! I used the Kaisercraft Pearls here and it really adds a lot to any project! OK so I loved this stamp so much that I actually made 2 projects this week and I have to share both with you! I love how this one turned out cause I used the copics sketch and I added some of the reddish browns to do the adorable traditional Irish look of reddish hair and peaches and cream skin. I love this image! OK I probably have said that like a million times but I can see myself saying that a couple more bazillion times! Hope you enjoy the eye candy and the spring colors to get us out of the winter weather! I figure if I use bright colors someone will get the hint with the weather! 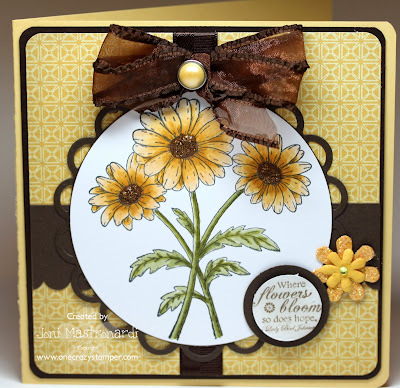 Darling Daisies from Whimsy Stamps. I stamped my image with Memento Tuxedo Black ink onto Express It CS and colored the daisies with copics, just a few, and added Rangers stickles to the centers. I cut out the focal image with a circle nestie and layered it onto a lacey circle nestie. I added a sheer brown ribbon bow. There is still time to join in the fun and play along. At least I thought it was! lol I woke up yesterday morning to SNOW. Today is suppose to be in the 50’s so that’s much better. 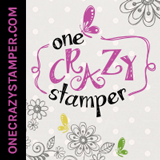 Much sure you check out One Crazy Stamper’s site for all the new Spring goodies! 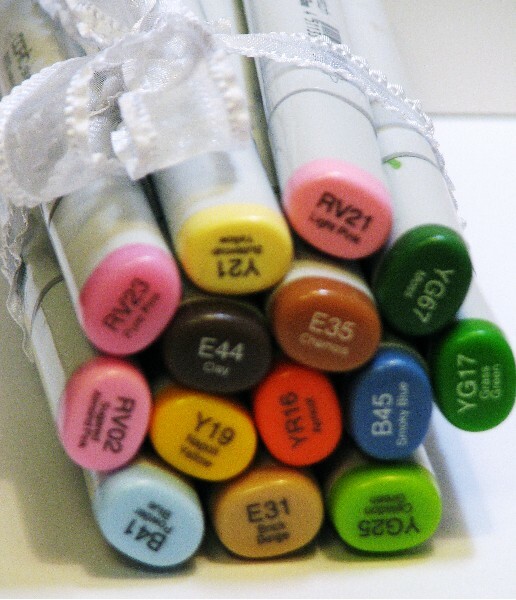 I can’t wait til the new Copic colors come in, I am already making room for them! Hi all, Madge here again. Today I’m using the cute little image from Whiff of Joy by Elizabeth Bell which can be found at One Crazy Stamper. These gorgeous images are whimsical, yet detail perfect. I used copics to color the image, too many to list. I apologize for the picture as my computer had a much needed “surgery” and I’ve lost my photo editing software (temporarily). Also lost all my email contacts / and emails……. (ugh, grrrr, rant, rave). Hopefully it will be restored soon. Supplies used: WOJ Umbrella Girl, Copics, Glossy Accents, Oval Nestabilities, Wild Orchid flowers, MS fern punch and misc. cardstock. Hope you’ve submitted a card for the OCS challenge for a chance to win $$$. Can’t wait to see what you come up with. 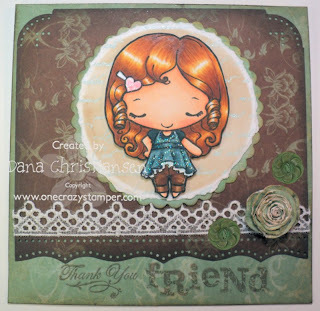 There's still plenty of time to enter our Sketch Challenge this month at One Crazy Stamper. I have to admit.. I am really starting to love the great images from The Greeting Farm!! This one is called Sweet Anya. I love these papers by Kaiser Craft called Jades Garden. I cut the Circle and Scallop Circle with my Nestabilities. I made the rolled flower with the a small square of the same paper from Kaiser Craft and just used the reverse side out. You can see how I make my rolled flowers here. I hope you get the chance to play along in the challenge!! 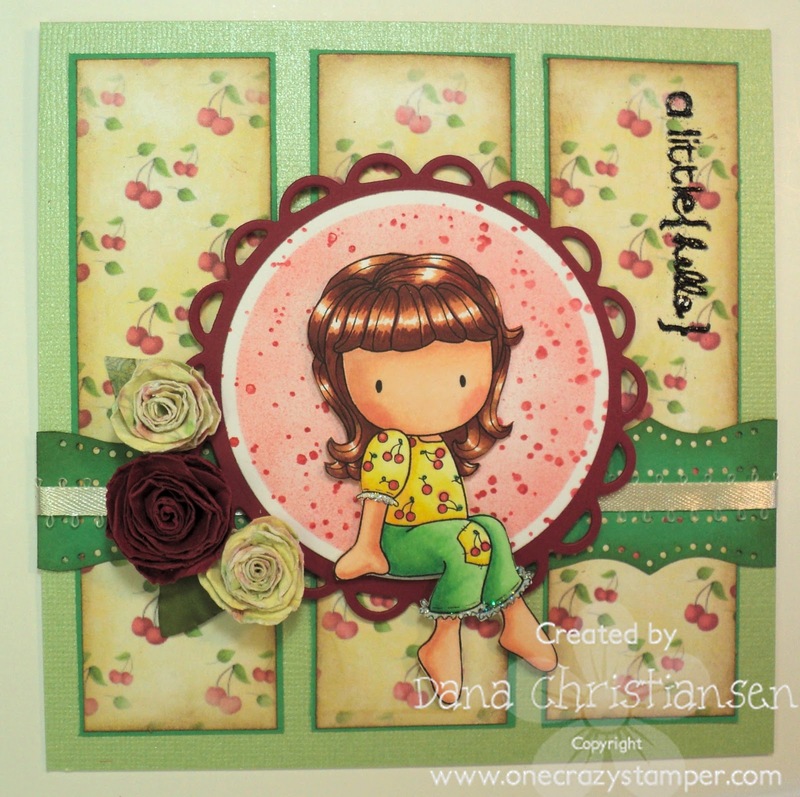 We love seeing all of your gorgeous creations and you could also win a $25 Gift Certificate to One Crazy Stamper! !